This article is about the drink. For other uses, see Rum (disambiguation). 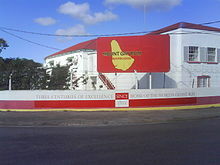 The Mount Gay Rum visitors centre in Barbados claims to be the world's oldest active rum company, with earliest confirmed deed from 1703. Given the harsh taste of early rum, this interpretation is unlikely. Morewood later suggested another possibility: that the word was taken from the last syllable of the Latin word for sugar, saccharum. This view is commonly held today. Competing hypotheses abound. One proposes that the word comes from the Turkish name for Greeks, Rum, as some of the earliest rum spirits were distilled by Greek Christians in the eastern Mediterranean. Other etymologists have mentioned the Romani word rum, meaning "strong" or "potent". These words have been linked to the ramboozle and rumfustian, both popular British drinks in the mid-17th century. However, neither was made with rum, but rather eggs, ale, wine, sugar, and various spices. The most probable origin is as a truncated version of rumbullion or rumbustion. Both words surfaced in English about the same time as rum did (Joan Coromines states 1651 as the first recording of "rumbullion", and 1654 for "rum" -1770 for the first recording in Spanish of ron), and were slang terms for "tumult" or "uproar". This is a far more convincing explanation, and brings the image of fractious men fighting in entanglements at island tippling houses, which are early versions of the bar. Vagbhata, an Indian ayurvedic physician (7th century AD) "[advised] a man to drink unvitiated liquor like rum and wine, and mead mixed with mango juice 'together with friends'". Shidhu, a drink produced by fermentation and distillation of sugarcane juice, is mentioned in other Sanskrit texts. According to Maria Dembinska, the King of Cyprus, Peter I of Cyprus or Pierre I de Lusignan (9 October 1328 – 17 January 1369), brought rum with him as a gift for the other royal dignitaries at the Congress of Kraków, held in 1364. This is feasible given the position of Cyprus as a significant producer of sugar in the Middle Ages, although the alcoholic sugar drink named rum by Dembinska might not have resembled modern distilled rums very closely. 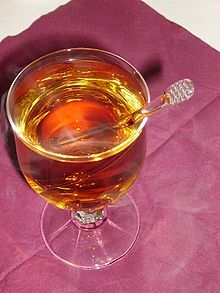 Dembinska also suggests Cyprus rum was often drunk mixed with an almond milk drink, also produced in Cyprus, called soumada. Another early rum-like drink is brum. Produced by the Malay people, brum dates back thousands of years. Marco Polo also recorded a 14th-century account of a "very good wine of sugar" that was offered to him in the area that became modern-day Iran. The first distillation of rum in the Caribbean took place on the sugarcane plantations there in the 17th century. Plantation slaves discovered that molasses, a byproduct of the sugar refining process, could be fermented into alcohol. Later, distillation of these alcoholic byproducts concentrated the alcohol and removed impurities, producing the first modern rums. Tradition suggests this type of rum first originated on the island of Barbados. However, in the decade of the 1620s, rum production was also recorded in Brazil. A liquid identified as rum has been found in a tin bottle found on the Swedish warship Vasa, which sank in 1628. After rum's development in the Caribbean, the drink's popularity spread to Colonial North America. To support the demand for the drink, the first rum distillery in the British colonies of North America was set up in 1664 on Staten Island. Boston, Massachusetts had a distillery three years later. The manufacture of rum became early Colonial New England's largest and most prosperous industry. New England became a distilling center due to the technical, metalworking and cooperage skills and abundant lumber; the rum produced there was lighter, more like whiskey. Rhode Island rum even joined gold as an accepted currency in Europe for a period of time. 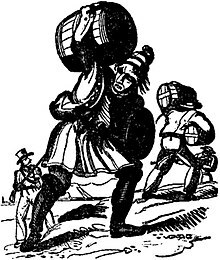 Estimates of rum consumption in the American colonies before the American Revolutionary War had every man, woman, or child drinking an average of 3 imperial gallons (14 l) of rum each year. To support this demand for the molasses to produce rum, along with the increasing demand for sugar in Europe during the 17th and 18th centuries, a labor source to work the sugar plantations in the Caribbean was needed. A triangular trade in rum, molasses, and slaves was established between Africa, the Caribbean, and the colonies to support this need. The exchange was quite profitable, and the disruption to the trade caused by the Sugar Act in 1764 may have even helped cause the American Revolution. In the slave trade, rum was also used as a medium of exchange. For example, the slave Venture Smith, whose history was later published, had been purchased in Africa for four gallons of rum plus a piece of calico. 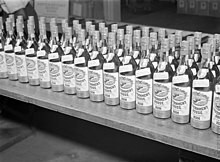 Rum started to play an important role in the political system; candidates attempted to influence the outcome of an election through their generosity with rum. The people would attend the hustings to see which candidate appeared more generous. The candidate was expected to drink with the people to show he was independent and truly a republican. While the ration was originally given neat, or mixed with lime juice, the practice of watering down the rum began around 1740. To help minimize the effect of the alcohol on his sailors, Admiral Edward Vernon had the rum ration watered, producing a mixture that became known as grog. Many believe the term was coined in honour of the grogram cloak Admiral Vernon wore in rough weather. The Royal Navy continued to give its sailors a daily rum ration, known as a "tot", until the practice was abolished after 31 July 1970. A legend involving naval rum and Horatio Nelson says that following his victory and death at the Battle of Trafalgar, Nelson's body was preserved in a cask of rum to allow transportation back to England. Upon arrival, however, the cask was opened and found to be empty of rum. The [pickled] body was removed and, upon inspection, it was discovered that the sailors had drilled a hole in the bottom of the cask and drunk all the rum, hence the term "Nelson's blood" being used to describe rum. It also serves as the basis for the term tapping the admiral being used to describe surreptitiously sucking liquor from a cask through a straw. 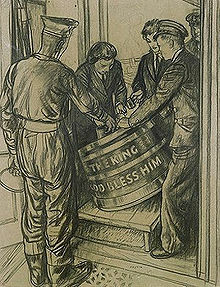 The details of the story are disputed, as many historians claim the cask contained French brandy, whilst others claim instead the term originated from a toast to Admiral Nelson. Variations of the story, involving different notable corpses, have been in circulation for many years. The official record states merely that the body was placed in "refined spirits" and does not go into further detail. The Royal New Zealand Navy was the last naval force to give sailors a free daily tot of rum. The Royal Canadian Navy still gives a rum ration on special occasions; the rum is usually provided out of the commanding officer's fund, and is 150 proof (75%). The order to "splice the mainbrace" (i.e. take rum) can be given by the Queen as commander-in-chief, as occurred on 29 June 2010, when she gave the order to the Royal Canadian Navy as part of the celebration of their 100th anniversary. Australia was so far away from Britain that the convict colony, established in 1788, faced severe food shortages, compounded by poor conditions for growing crops and the shortage of livestock. Eventually it was realized that it might be cheaper for India, instead of Britain, to supply the settlement of Sydney. By 1817, two out of every three ships which left Sydney went to Java or India, and cargoes from Bengal fed and equipped the colony. Casks of Bengal Rum (which was reputed to be stronger than Jamaican Rum, and not so sweet) were brought back in the depths of nearly every ship from India. The cargos were floated ashore clandestinely before the ships docked, by the British Marines regiment who controlled the sales. It was against the direct orders of the governors, who had ordered the searching of every docking ship. Britons living in India grew wealthy through sending ships to Sydney "laden half with rice and half with bad spirits." Rum was intimately involved in the only military takeover of an Australian government, known as the Rum Rebellion. When William Bligh became governor of the colony, he attempted to remedy the perceived problem with drunkenness by outlawing the use of rum as a medium of exchange. In response to Bligh's attempt to regulate the use of rum, in 1808, the New South Wales Corps marched with fixed bayonets to Government House and placed Bligh under arrest. The mutineers continued to control the colony until the arrival of Governor Lachlan Macquarie in 1810. Dividing rum into meaningful groupings is complicated because no single standard exists for what constitutes rum. Instead, rum is defined by the varying rules and laws of the nations producing the spirit. The differences in definitions include issues such as spirit proof, minimum ageing, and even naming standards. States and territories that had been formerly part of the Spanish Empire traditionally produce añejo rums with a fairly smooth taste. Rums from Colombia, Cuba, the Dominican Republic, Guatemala, Nicaragua, Panama, the Philippines, Puerto Rico and Venezuela are typical of this style. Rum from the U.S. Virgin Islands is also of this style. The Canary Islands produces honey rum known as ron miel de Canarias and carries a geographical designation. In West Africa, and particularly in Liberia, 'cane juice' (also known as Liberian rum or simply CJ within Liberia itself) is a cheap, strong spirit distilled from sugarcane, which can be as strong as 43% ABV [86 proof]. A refined cane spirit has also been produced in South Africa since the 1950s, simply known as cane or "spook". Within Europe, in the Czech Republic and Slovakia, a similar spirit made from sugar beet is known as Tuzemak. In Germany, a cheap substitute for genuine dark rum is called Rum-Verschnitt (literally: blended or "cut" rum). This distilled drink is made of genuine dark rum (often from Jamaica), rectified spirit, and water. Very often, caramel coloring is used, too. The relative amount of genuine rum it contains can be quite low, since the legal minimum is at only 5%. In Austria, a similar rum called Inländerrum or domestic rum is available. However, Austrian Inländerrum is always a spiced rum, such as the brand Stroh; German Rum-Verschnitt, in contrast, is never spiced or flavored. Dark rums, also known by their particular colour, such as brown, black, or red rums, are classes a grade darker than gold rums. They are usually made from caramelized sugar or molasses. They are generally aged longer, in heavily charred barrels, giving them much stronger flavors than either light or gold rums, and hints of spices can be detected, along with a strong molasses or caramel overtone. They commonly provide substance in rum drinks, as well as colour. In addition, dark rum is the type most commonly used in cooking. Most dark rums come from areas such as Jamaica, Haiti, and Martinique. Gold rums, also called "amber" rums, are medium-bodied rums that are generally aged. These gain their dark colour from aging in wooden barrels (usually the charred, white oak barrels that are the byproduct of Bourbon whiskey). They have more flavor and are stronger-tasting than light rum, and can be considered midway between light rum and the darker varieties. Light rums, also referred to as "silver" or "white" rums, in general, have very little flavor aside from a general sweetness. Light rums are sometimes filtered after aging to remove any colour. The majority of light rums come from Puerto Rico. Their milder flavors make them popular for use in mixed drinks, as opposed to drinking them straight. Light rums are included in some of the most popular cocktails including the Mojito and the Daiquiri. Spiced rums obtain their flavors through the addition of spices and, sometimes, caramel. Most are darker in colour, and based on gold rums. Some are significantly darker, while many cheaper brands are made from inexpensive white rums and darkened with caramel colour. Among the spices added are cinnamon, rosemary, absinthe/aniseed, pepper, cloves, and cardamom. 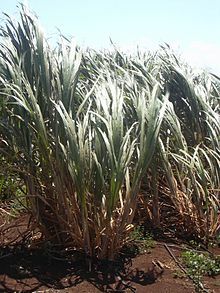 Most rum is produced from molasses, which is made from sugarcane. A rum's quality is dependent on the quality and variety of the sugar cane that was used to create it. The sugar cane's quality depends on the soil type and climate that it was grown in. Within the Caribbean, much of this molasses is from Brazil. A notable exception is the French-speaking islands, where sugarcane juice is the preferred base ingredient. In Brazil itself, the distilled alcoholic drink derived from cane juice is distinguished from rum and called cachaça. Many countries require rum to be aged for at least one year. This ageing is commonly performed in used bourbon casks, but may also be performed in other types of wooden casks or stainless steel tanks. The ageing process determines the colour of the rum. When aged in oak casks, it becomes dark, whereas rum aged in stainless steel tanks remains virtually colourless. After ageing, rum is normally blended to ensure a consistent flavour. Blending is the final step in the rum-making process. As part of this blending process, light rums may be filtered to remove any colour gained during ageing. For darker rums, caramel may be added to adjust the colour of the final product. Artificial ageing attempts to match the molecular composition of aged rum using heat and light. Rum may also be used as a base in the manufacture of liqueurs and syrups, such as falernum and most notably, Mamajuana. ^ a b c d e f Pacult, F. Paul (July 2002). "Mapping Rum By Region". Wine Enthusiast Magazine. ^ "The West Indies Rum Distillery Limited". WIRD Ltd. 2009. Retrieved 28 April 2011. ^ Wayne Curtis. "The Five Biggest Rum Myths". Liquor.com. ^ Rajiv. M (12 March 2003). "A Caribbean drink". The Hindu. ^ Achaya, K. T. (1994). Indian Food Tradition A Historical Companion. Oxford University Press. pp. 59, 60. ISBN 978-0195644166. ^ "Arkeologerna: Skatter i havet". UR Play. ^ a b Frost, Doug (6 January 2005). "Rum makers distill unsavory history into fresh products". San Francisco Chronicle. ^ Rorabaugh, W.J. (1981). The Alcoholic Republic: An American Tradition. Oxford University Press. pp. 152–154. ISBN 978-0195029901. ^ Buckner, Timothy Ryan (2005). "Constructing Identities on the Frontier of Slavery, Natchez Mississippi, 1760-1860" (PDF). p. 129. Retrieved 6 November 2012. ^ Mikkelson, Barbara (9 May 2006). "Body found in barrel". Urban Legends Reference Pages. Snopes.com. Archived from the original on 15 January 2009. Retrieved 15 January 2009. ^ "At a temperance meeting recently held in New Zealand, an intemperate chief addressed the audience, to the surprise of all, in favor of banning rum from the country. Some rude-rum selling foreigners interrupted him with a sneer that he was the greatest drunkard in the region". From The Religious Monitor, or Evangelical Repository Vol. XIV, Hoffman & White, 1837-39, p. 480. ^ Selsky, Andrew (15 September 2003). "Age-old drink losing kick". The Miami Herald. 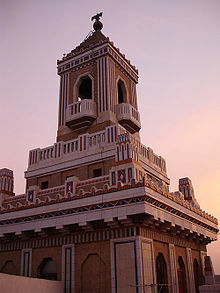 ^ "Tourism Industry in Liberia". Uniboa.org. Archived from the original on 31 May 2009. Retrieved 5 December 2009. ^ "Photo-article on Liberian village life". Pages.prodigy.net. Retrieved 15 January 2018. ^ Warburton, Rob (11 January 2019). "Types of Rum: A Closer Look at The Styles & Variations". The Rum Guys. ^ a b c d e Vaughan, Mark (1 June 1994). "Tropical Delights". Cigar Aficionado. ^ Nicol, Denis A. (2003). "Rum". In Lea, Andrew G.H. ; Piggott, John R. (eds.). Fermented Beverage Production. Link.springer.com. Springer, Boston, MA. pp. 263–287. doi:10.1007/978-1-4615-0187-9_12. ISBN 978-0-306-47706-5. ^ Branch, Legislative Services. "Consolidated Federal Laws of Canada, Food and Drug Regulations". laws.justice.gc.ca. Retrieved 19 July 2017. ^ "Manufacturing Rum". Archived from the original on 20 November 2003. Retrieved 6 November 2012. ^ Curtiss, Wayne. "One Man's Quest to Make 20-Year-Old Rum in Just Six Days". Wired (30 May 2017). Retrieved 28 July 2017. Blue, Anthony Dias (2004). The Complete Book of Spirits : A Guide to Their History, Production, and Enjoyment. HarperCollins. ISBN 978-0-06-054218-4. Clarke, Frank G. (2002). The History of Australia. Greenwood Press. ISBN 978-0-313-31498-8.
Cooper, Rosalind (1982). Spirits & Liqueurs. HPBooks. ISBN 978-0-89586-194-8. Foley, Ray (2006). Bartending for Dummies: A reference for the Rest of Us. Wiley Publishing, Inc. ISBN 978-0-470-05056-9. Pack, James (1982). Nelson's Blood: The Story of Naval Rum. Naval Institute Press. ISBN 978-0-87021-944-3. "Rum" . Encyclopædia Britannica (11th ed.). 1911. This page was last edited on 21 April 2019, at 04:50 (UTC).